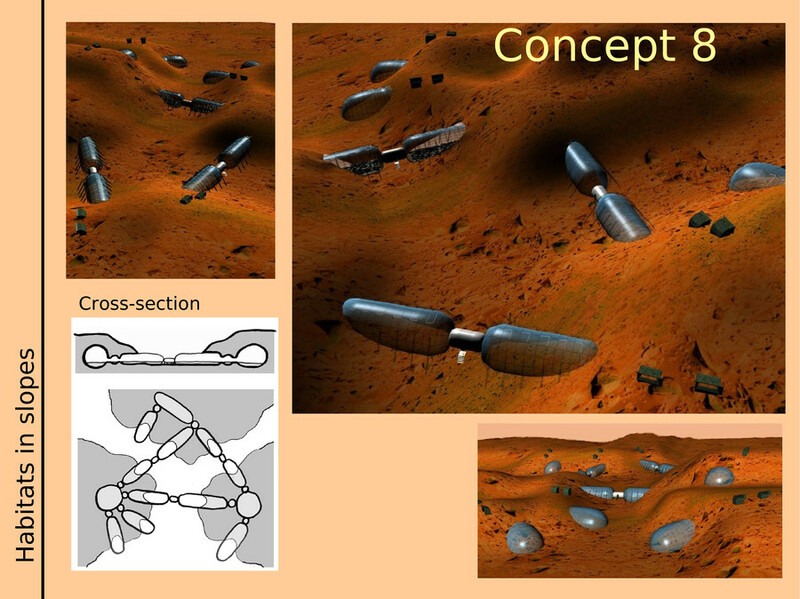 This presentation was shown on Mars Society convention in Bergamo, Italy, 16 October 2009. 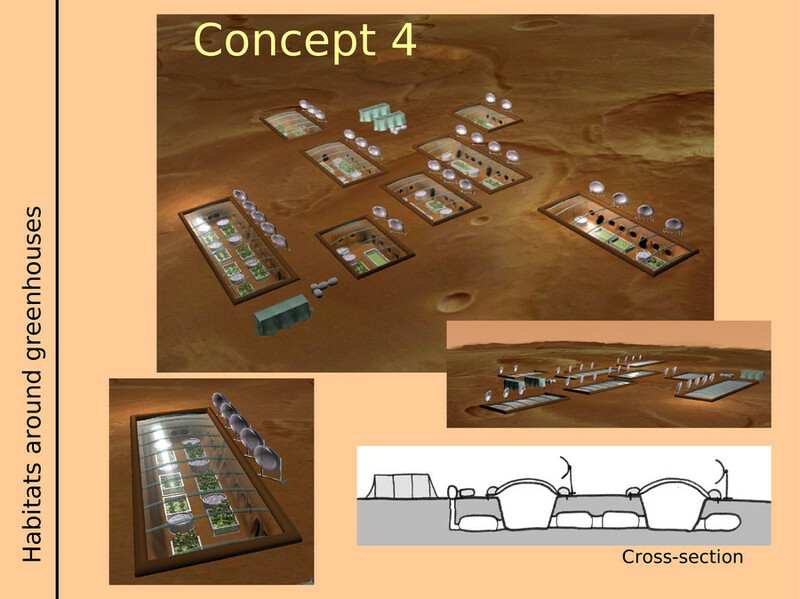 If we want to send people to Mars we need a proper habitat to provide living and working area. The bigger crew, the bigger habitat is required. 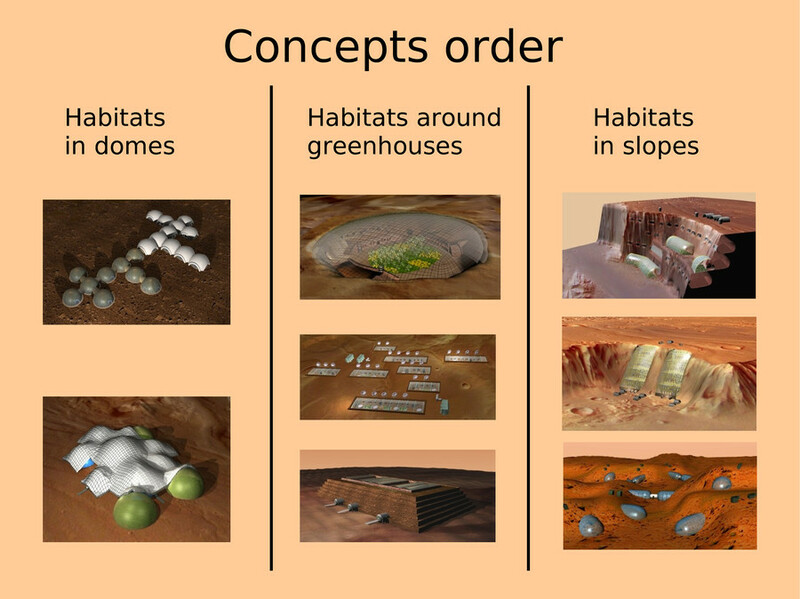 The big habitat is obvious if we think about Mars colonization. 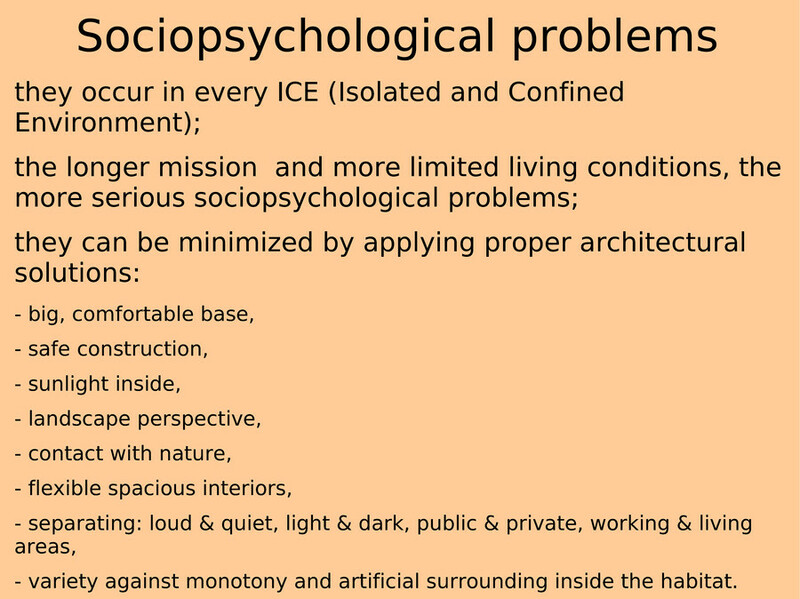 Sociopsychological problems occur in every Isolated and Confined Environment, like during a polar or space mission. It means physiological and psychological diseases - from headaches and sleep disorders to emotional breakdowns. Interpersonal conflicts also may become very dramatic. The longer the mission, and more limited living conditions, the more serious problems occur. Sociopsychologists alert that human factor has a decisive impact on a Mars mission success or failure. 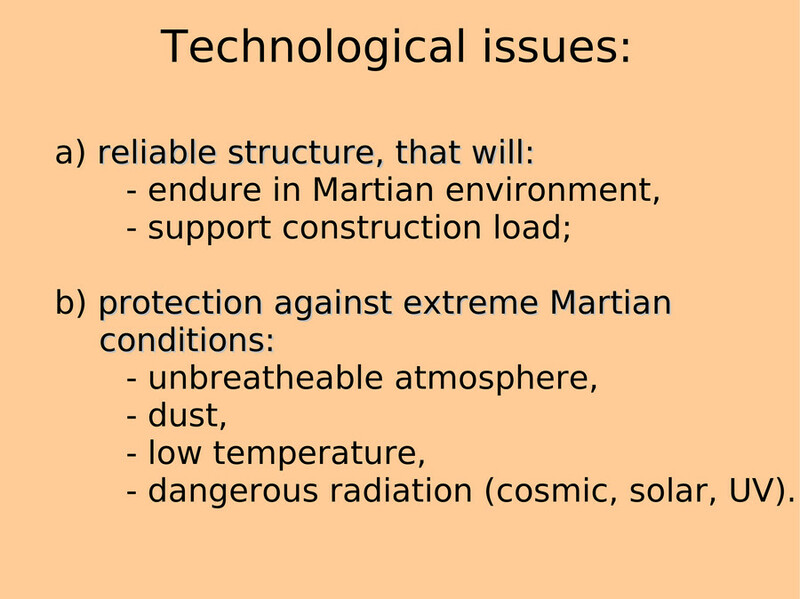 The building needs protection against extreme Martian conditions to secure people inside. The habitat must be hermetic to avoid mixing unbreathable Martian atmosphere with the artificial one, and to avoid dust accumulation. The temperature inside the habitat should be high enough and stable, so thermal insulation might be required. The base also needs a protection against cosmic solar and UV radiation, which are a threat for people and equipment. 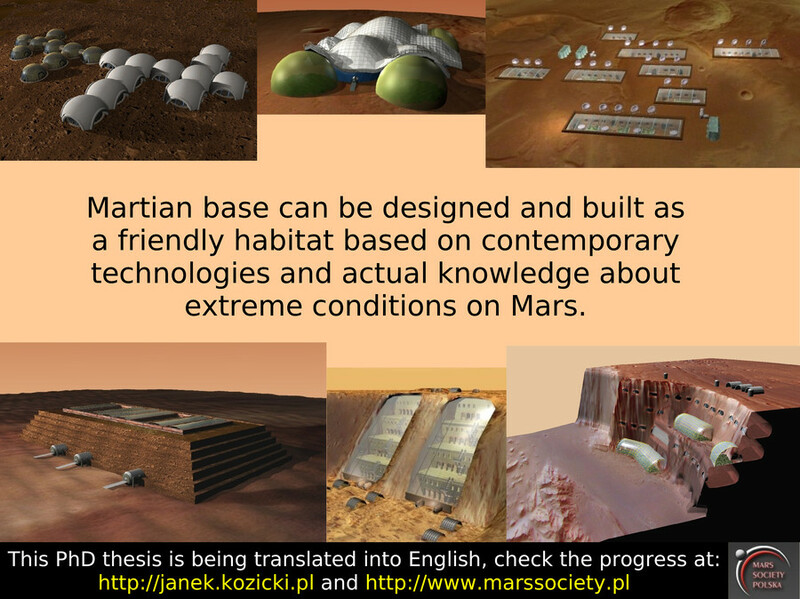 My analyses show that there exists contemporary building technologies and materials that can be adapted in Martian base construction. Some of them have been already discussed by other scientists, some not. 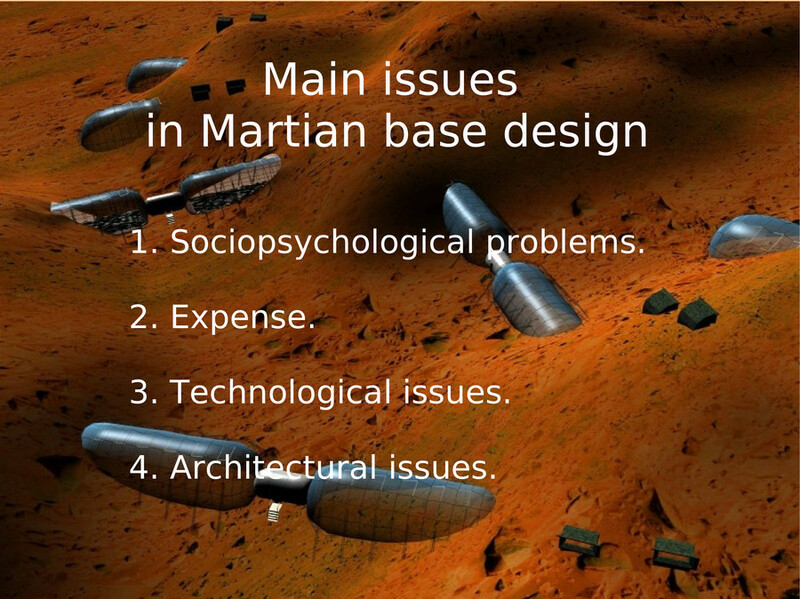 Four main types of building structures appear to be the best solutions for the Martian base. 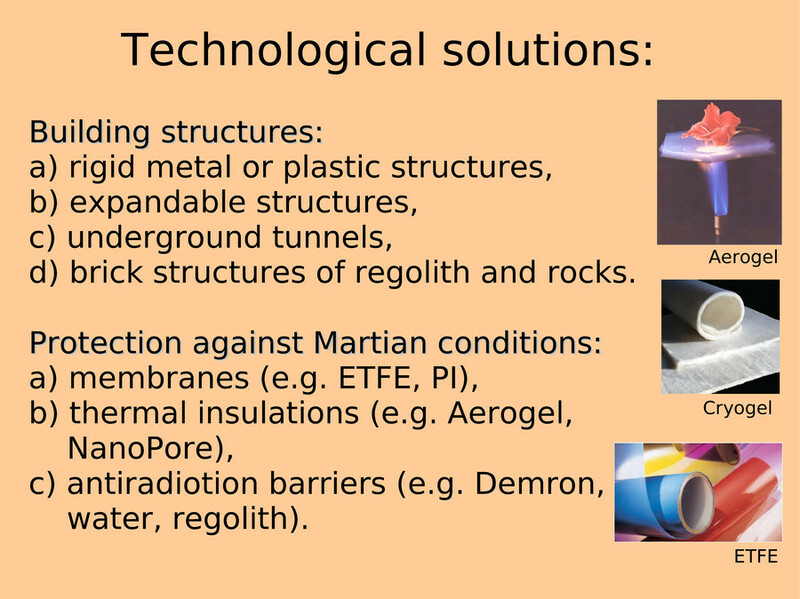 - antiradiation barriers like Demron, water or regolith. Now I will shortly discuss recommended building technologies. The most characteristic unfolding structure is a Hoberman's dome. 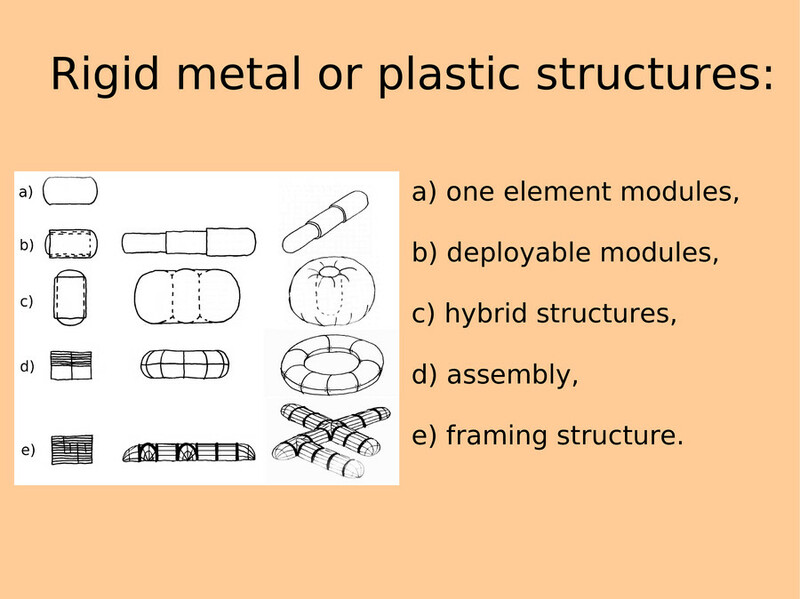 The lattice structure can be plastic or metal. A fabric can be attached to the framing or panels can be fastened on the unfolded structure. 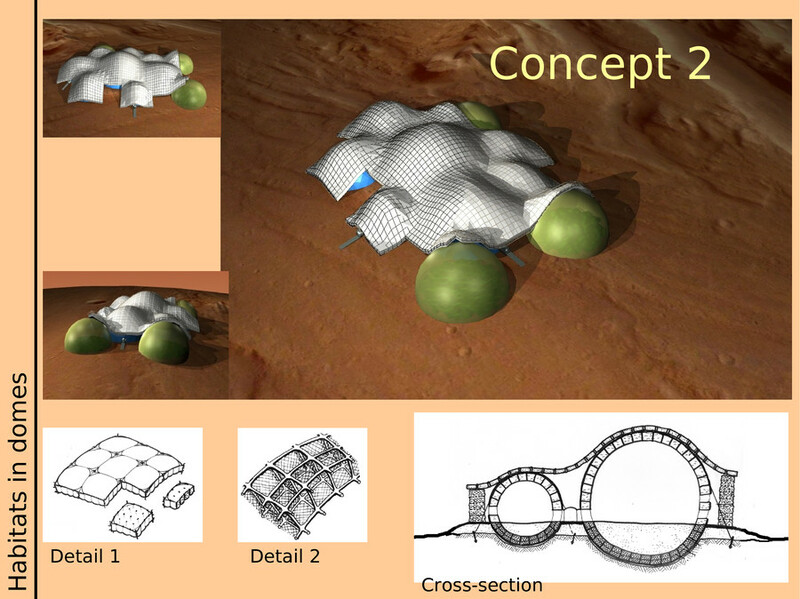 Inflatable structure is especially useful in Martian conditions, because filling it with an artificial atmosphere, we deploy the construction simultaneously. They are very light and provide very spacious area after the deployment. 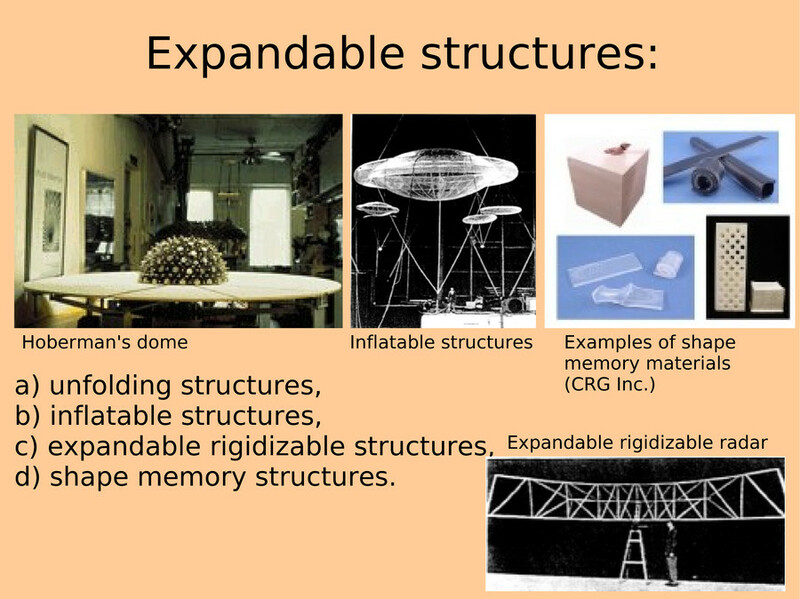 Inflatable structures are usually a kind of balloon. But inflated can be also a truss made of pneumatic tubes. It is more sophisticated structure, but it allows to get another type of building element. And example of such a structure is an expandable rigidizable radar. On Mars dominate hard volcanic rocks, similar to terrestrial basalts and andesites. On Earth, inside such compacted rocks, tunnels are excavated with PCF (Penetrating Cone Fracture) and drill & blast method. The first one is less aggressive for the environment, but the second one is more affective. They could be adopted on Mars. If the rock layer is thick and homogeneous, tunnels drilled inside them may be self-supported and the expensive lining is not required. 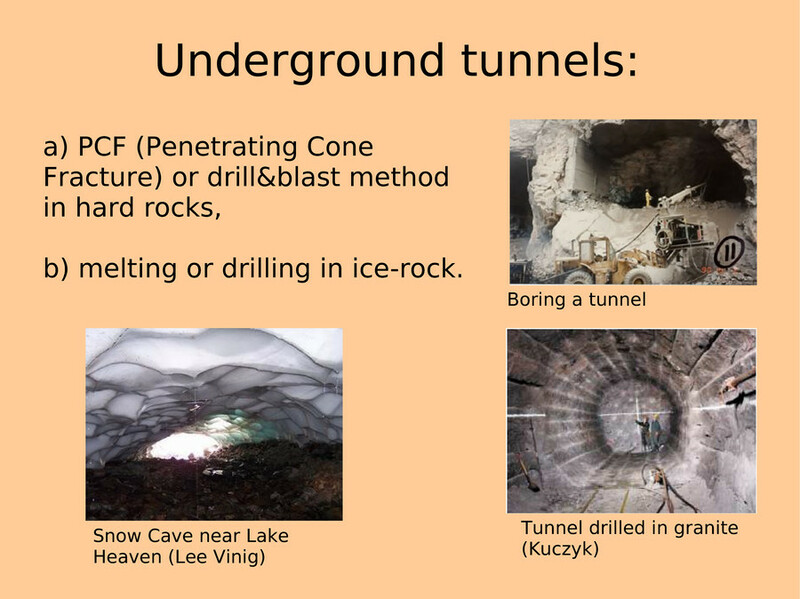 We can also drill habitable tunnels inside big ice rocks that have been discovered on Mars. The layer of ice above would be a great solar radiation barrier. Small elements put one on another in layers may be formed into walls or arches. However many of them require moisture, another framing or loading to complete the structure. Based on all my guidelines, I have created several different Mars base concepts. I will discuss them in an order. First habitats in domes, later habitats around greenhouses and eventually habitats in slopes. Inflatables are the lightest and the easiest in deployment structures, so they seem the most promising solution for the Martian base. I propose two concepts with pneumatic domes. In the first one a modular element is applied. 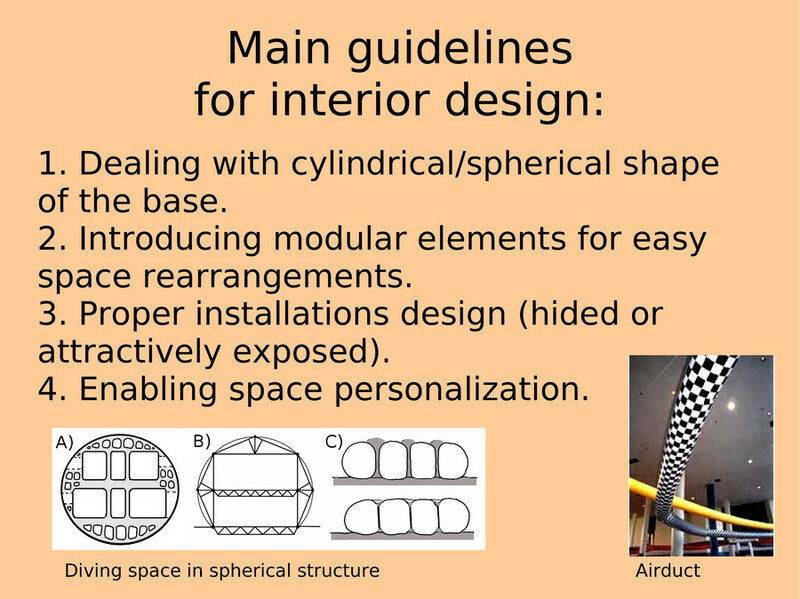 Domes can be differently arranged by attaching them one to another by an elastic airlock. 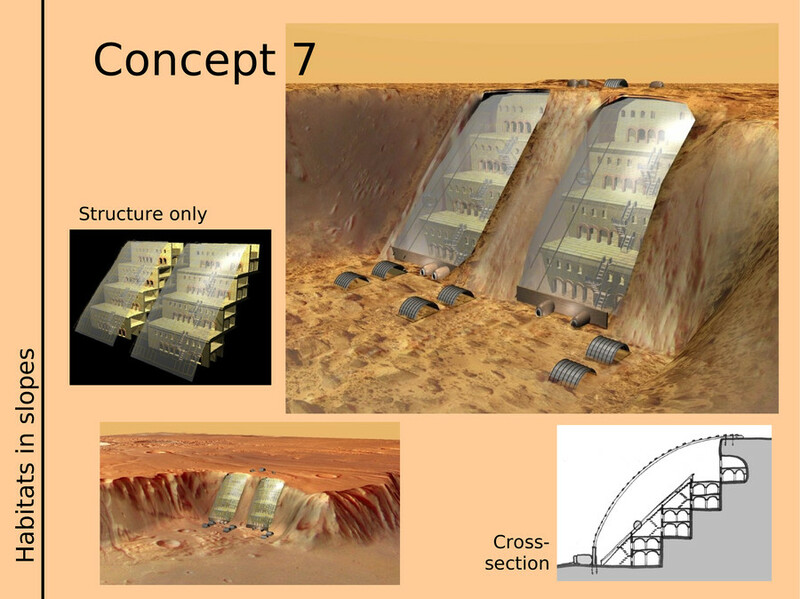 We can bring only one or two modules for the first crew on Mars, later we could send more for the base development. 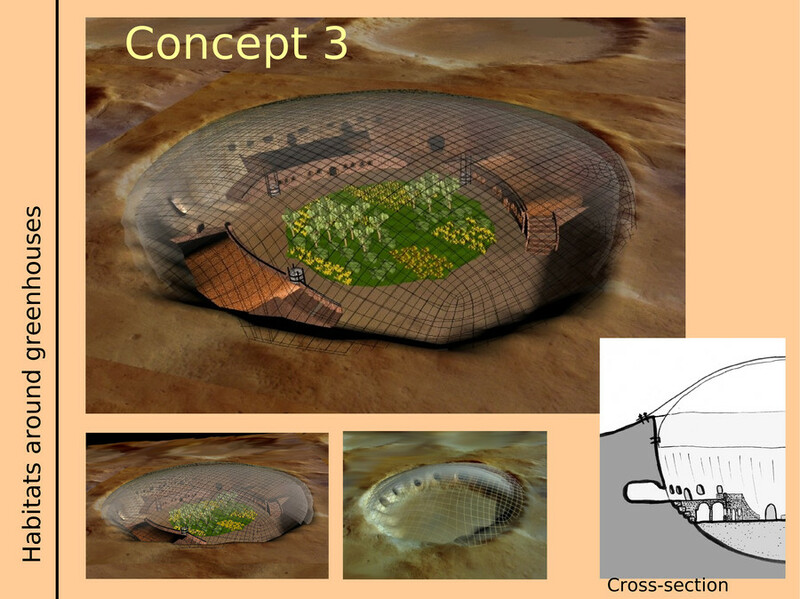 Inside the unsheltered dome, plants would be grown or recreational area could be provided. 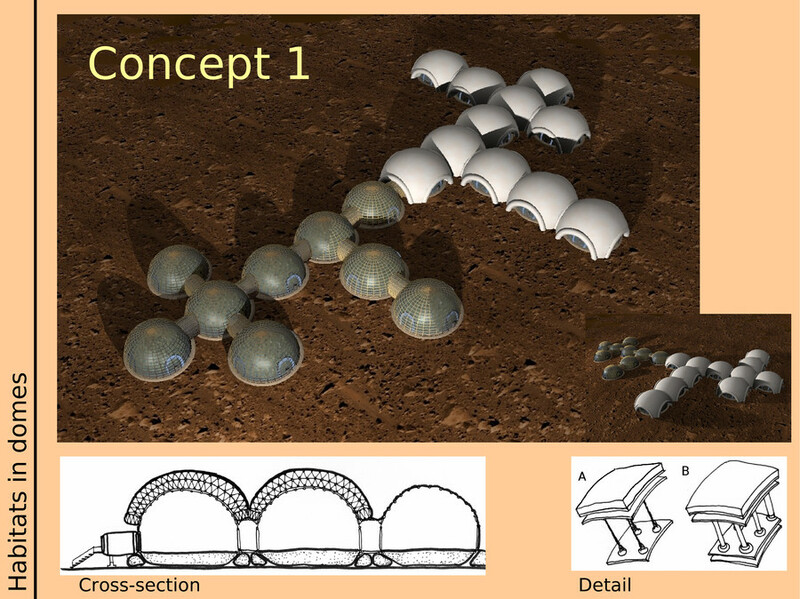 Living and working area would be introduced inside modules covered with a mantle filled with water or regolith. Here we have got domes in different sizes. Thus people would easier recognize the places in habitat and functional differences could be introduced, e.g. greenhouses are the in the biggest domes. There already exist terrestrial inflatable dome-like structures. Some of them are fully transparent, e.g. Eden project or Euphore laboratory. Zorbing ball is a special inspiration as it has an inflatable layer. On Mars this layer can be filled with antiradiation material (such as water or regolith). 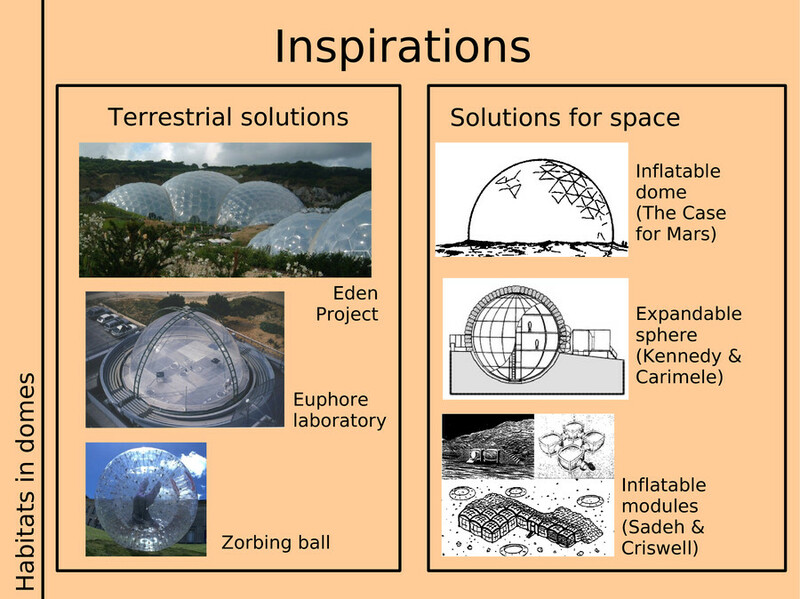 In literature I have found different solutions for expandable structures, like inflatable dome from "The Case for Mars" or pneumatic cubic modules of Sadeh & Crisswell. A well-known opportunity is to settle a base inside a crater. However the crater cannot be too big, because of the sealing difficulties. Under the transparent roof anchored in the rims of the crater, plants could be grown. 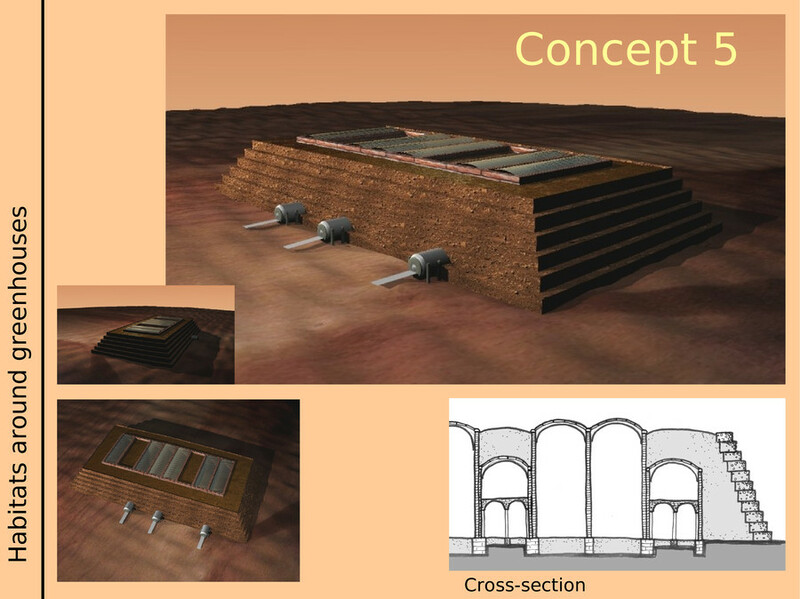 People would be able to build brick structures inside, or excavate tunnels in the slopes. We could also make excavations in a chosen shape and length. Inside slopes habitable tunnels would be made. Windows cut through would let the sunlight penetrate the inside. A greenhouse could be built also on the ground with brick walls sealed with transparent roofs. People would live in vaults built along agriculture areas. 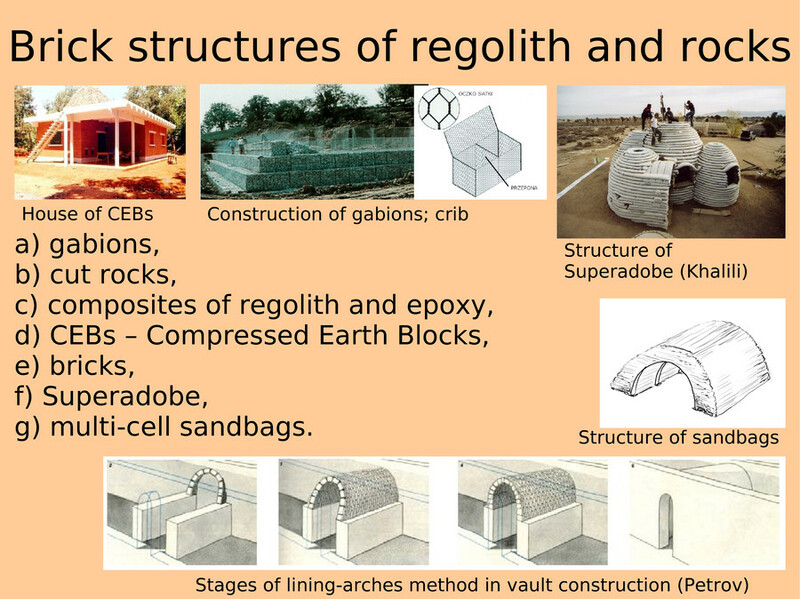 A layer of regolith would be reinforced by gabions. Underground houses around yards are common in China and Tunisia (Matmata region). This solution is chosen also sometimes in contemporary architecture. 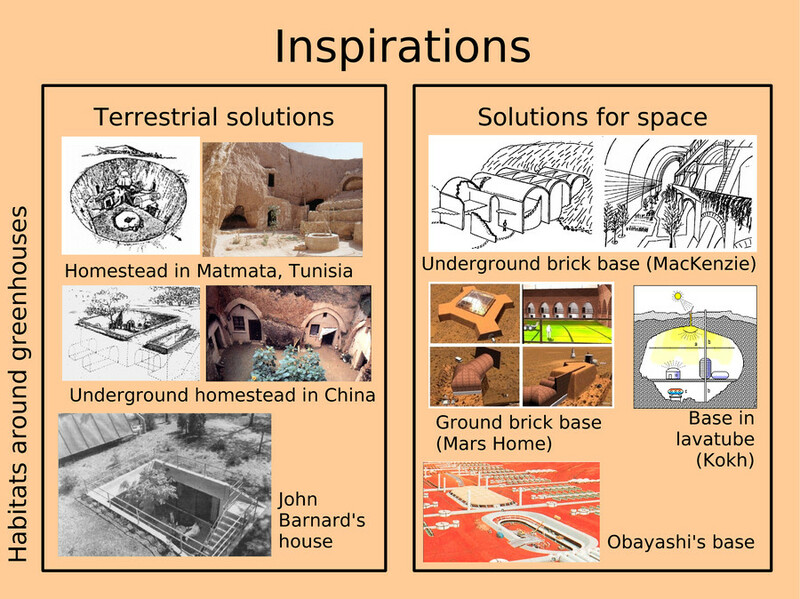 Here there are shown some Mars base concepts from literature. 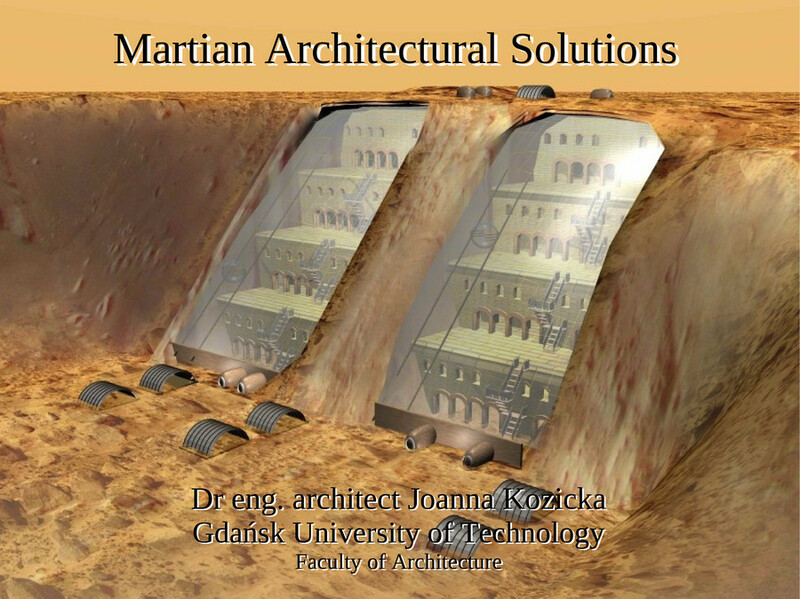 By applying excavation technologies we can establish the Martian base in slopes. 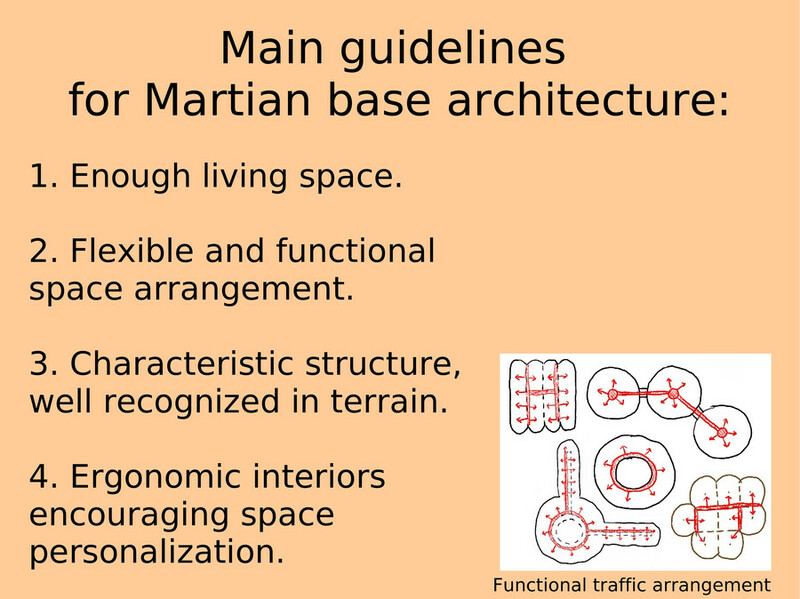 They are common terrain formations on the Red Planet. Underground tunnels could be made, and inflatable greenhouses could be anchored on the rock shelves or at the foot of the cliff. Also terraces could be excavated and later sealed. Here is an another concept of the habitat in slope. Here there are presented inflatable cylinders that are partly inserted into slopes, so a half is protected against radiation by a layer of regolith, and the other half is lighten by the sun, so plants can be grown there. 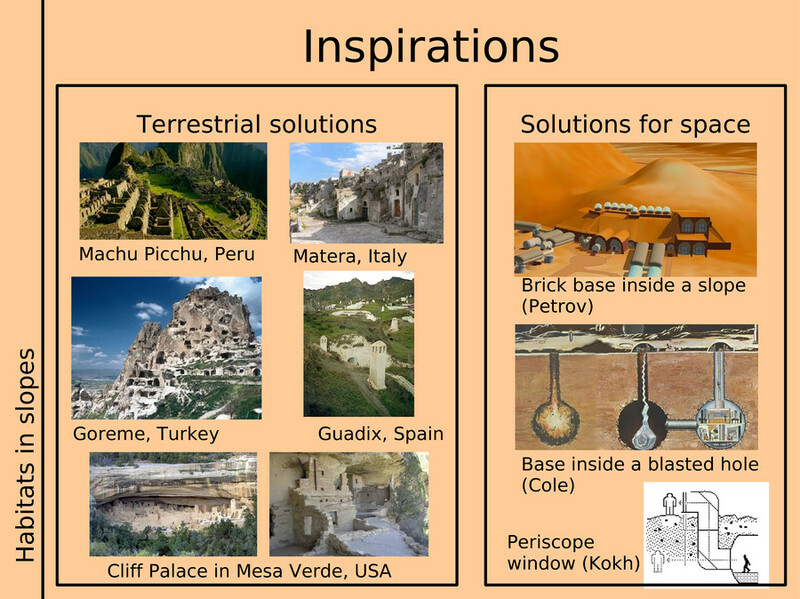 People of many cultures built their homes on shelf rocks or excavated them in rocks, like Indians in Mesa Verde, USA (Cliff Palace) or inhabitants of Capadocia, Turkey (Goreme Valley, Derinkuyu underground city). Here there are some concepts of extraterrestrial habitats found in literature. Here I show some of my ideas for interiors in the Martian base. 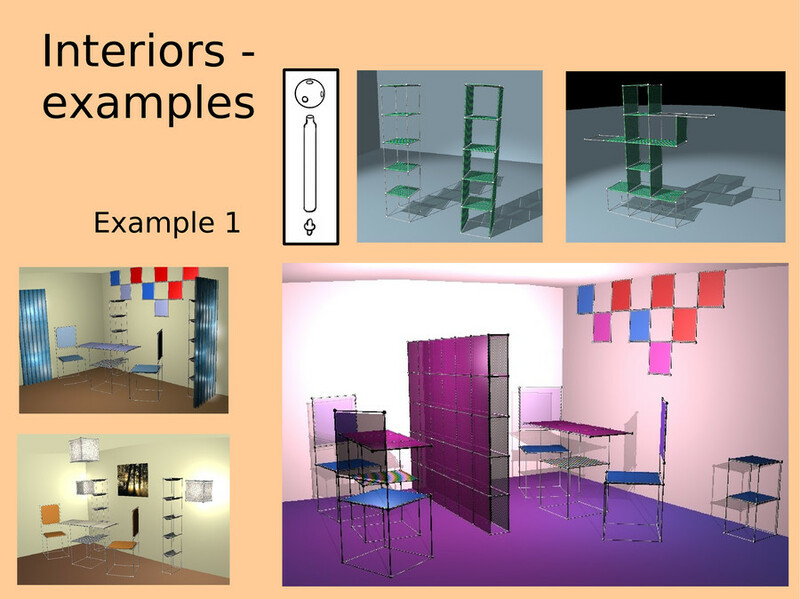 Simple elements in modular sizes can be joined to create different types of furniture: shelves, chairs, tables etc. A textile cover in different colors would provide characteristic atmosphere / mood in every room, so space personalisation is achieved. Here there are other examples. We can use inflatables, shape memory materials or ceramic elements. Proper LED lighting could be applied to provide different colors in rooms. 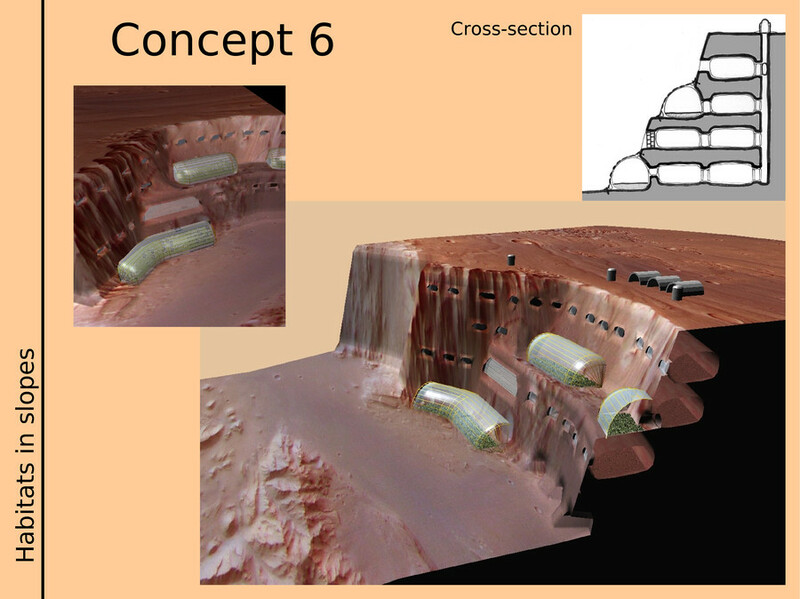 I've chosen one of my concepts to make a conceptual project of the Martian base. 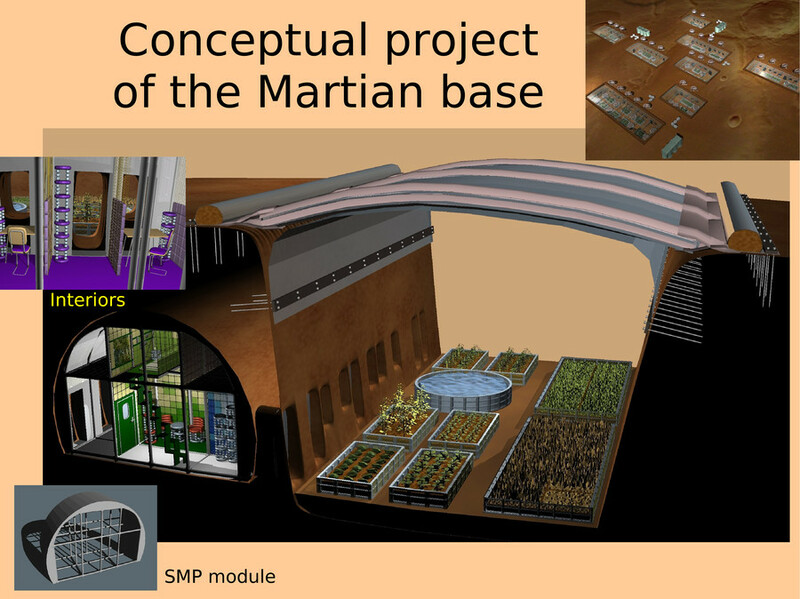 Some pictures are shown here: main view; cross section with perspective of the part of the greenhouse and underground habitable tunnel. 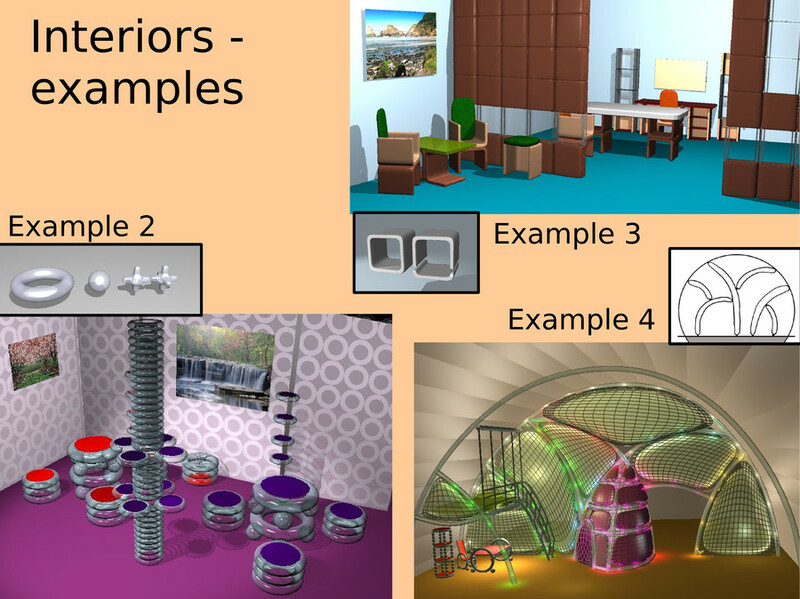 You can see also a proposition of interior design. 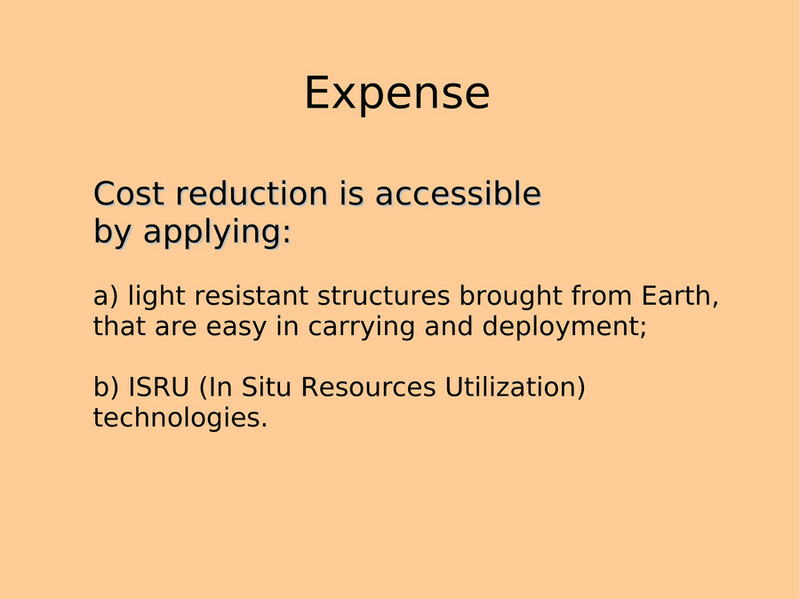 It doesn't have to be very expensive if we reach out for low-cost solutions - it means bringing from Earth only the lightest but resistant structures and applying ISRU with equipment only once imported to be used many times on different tasks. Thank you for your attention.